According to some historians, the project for the reconstruction of the bridge can be ascribed to Taddeo Gaddi, a disciple of Giotto. He solved the problem of the downflow during floods by reducing the overall encumbrance of the bridge inside the river, so that the structure that we now see and enjoy is still the same. For the first time depressed arches were employed to allow a greater distance between piers without bending the road surface, which made it possible to reduce piers from five to three, slender and finely shaped ones too. The upper part of the bridge was divided in two parts on each side, separated in the middle by two lay-bys. The two blocks on the side of Por Santa Maria were composed by twelve shops on each side, while those on the Oltrarno (the “other side” of the Arno) were eleven per side: the last places were occupied by the Mannelli Tower on one side, and the Magione del Santo Sepolcro (the “Mansion of the Sacred Sepulchre”) on the other side. The shops were intended to be 46, but historians talk about 43 only: probably three places were used for different purposes. The Old Bridge, too, like all bridges of the period, hosted a little chapel, and it was probably the Oratorio del Santo Sepolcro (“Oratory of the Holy Sepulchre”), with a wrought iron gate and a little altar inside. It was likely situated on the last space on the right, corresponding to the 52 red number of today. Regarding dimensions, the bridge was 93,90m long and 18,50m wide, with bays with a maximum span of 28m. The shops were 8 fathoms, on the 16 fathom width of the street, which made the lay-bys measure 32 by 32 fathoms. Those shops yielded the town council a significant revenue – more or less 80 gold fiorins – and were rented to butchers, which ensured that the characteristic blood and dead animals with all the foul odour stayed out of the patrician houses in the city centre. In 1495 the town council decided to sell all shops to private citizens. By that time the shops were four, so the new owners began to build additional levels, split spaces and advance over the piers, each one according to their will and needs, and careless of symmetry, balance and an overall consideration of the structure as a whole. 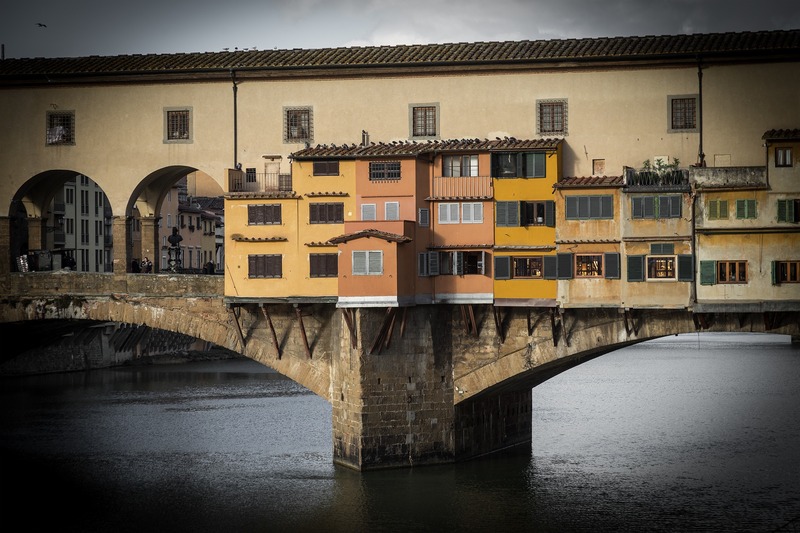 The Ponte Vecchio Old Bridge was further spoilt and considerably altered when many of the new owners, in order to obtain even more space, had their shops jut outwards with brackets and wooden buttresses. 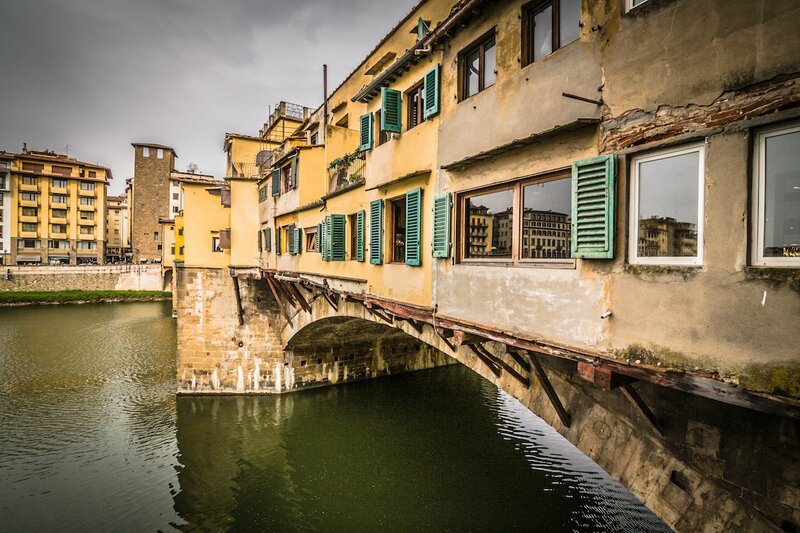 After the 1547 and 1557 floods, the shop owners had to reconstruct the shops over the Old Bridge with their own money, and that is when the bridge’s symmetries were badly altered. 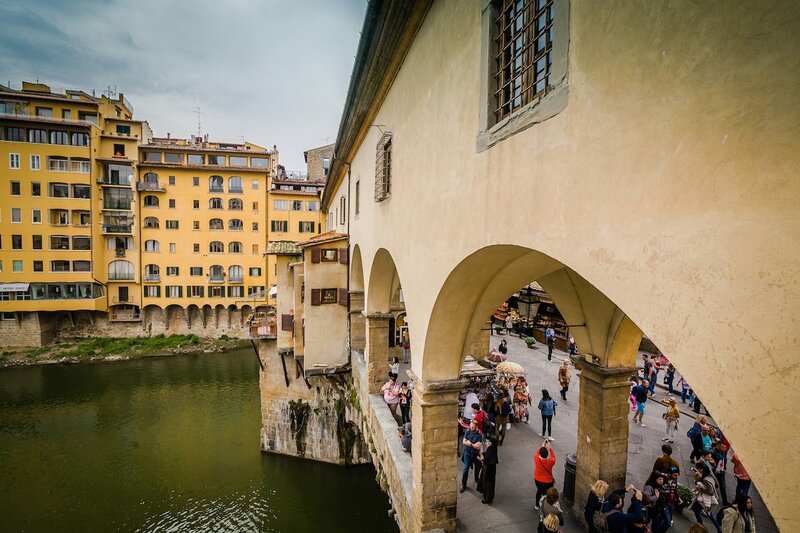 In 1565 the town council intervened, committing a new project for the architecture of the bridge to Giorgio Vasari: the “Corridor” (“Corridoio Vasariano”) was built, and radically changed the Ponte Vecchio image, creating two different heights in the blocks. The central lay-by on one side remained the same as before, whereas the one upriver was closed by a three-arcade portico, that was needed to support the overhead passage of the Vasarian Corridor. According to a survey ordered by Cosimo I during the middle of the 16th century, the bridge hosted 3 butchers, 3 delicatessen sellers, 5 shoemakers, 2 carpenters, 2 grain sellers, 1 drinking glass maker, 1 haberdasher, 1 second-hand dealer and another ten or so different dealers; among these was mentioned a tavern with a dragon as its sign. Only the high artistic culture of the Grand Duke Ferdinand I put an end to this concoction of ugliness over the Old Bridge: while walking over the Corridor and taking a look over the bridge, he noticed the lack of respectability of most of the shops, the terrible smell, the chaos and the vulgarity of many shopkeepers. Thus, on September 25th, 1593, the Grand Duke issued an announcement where all “dirty” shopkeepers must be evacuated, and the emptied shops be given only to goldsmiths, jewellers and silversmiths. The ultimate purpose was to render the Old Bridge a “place where gentlemen and strangers meet”. The goldsmiths were 41 and the jewellers 8, and this concentration of high-class activities, which was to last up to the present day, gave the Old Bridge a unique attractiveness for wealthy Europeans. 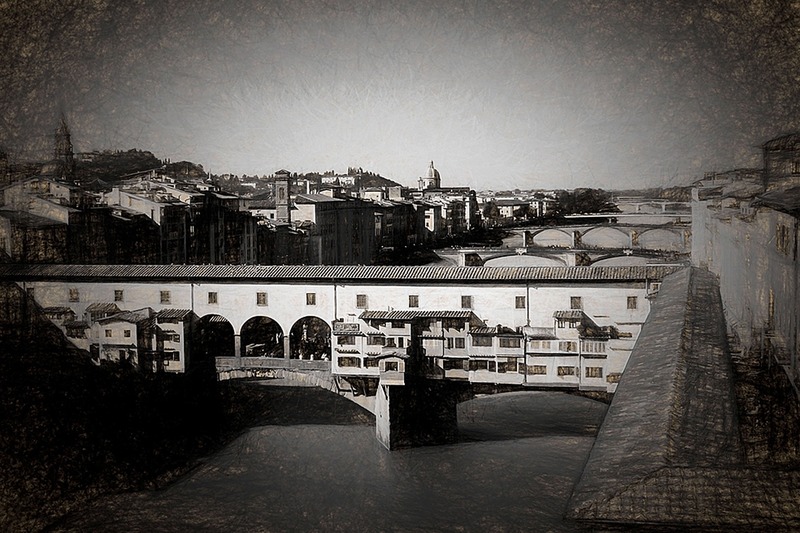 The regular visits of a selected international clientele contributed to a public image of the Bridge as the centre of a rich and prestigious Florence. In order to better exploit the space available, to show their artefacts, but also to make their workshops safer, the goldsmiths of that time invented the so-called “madielle”: the folding shutters made of wood and iron that are still used today, and still admired. During 1600 and 1700 the many shops were destined to the sale but also to the production of jewellery. These workshops were generally on two floors and were accessed through a narrow door. On both sides of the door, there were stone banks over a supporting wall. There isn’t much information about the Bridge during 1700, but we know that the height of the workshops not concerned by the Vasarian Corridor was increased, almost falling into line with the Corridor itself. In 1700, also, architects and urbanists made projects with the aim of giving a new shape to the entire structure, of giving an idea of order and symmetry to a bridge where buildings had been haphazardly stacked. Travellers and tourists, especially the Anglo-Saxons, found it already extraordinarily “picturesque”. In 1841 the Town Council commissioned Engineer Casini to substitute the already deteriorated wooden canopies with a unique long terrace with a railing. Also architect Giuseppe Martelli had produced two projects but they were rejected; one of them was the closing over the street with a glass and iron structure, as in Parisian shopping arcades. 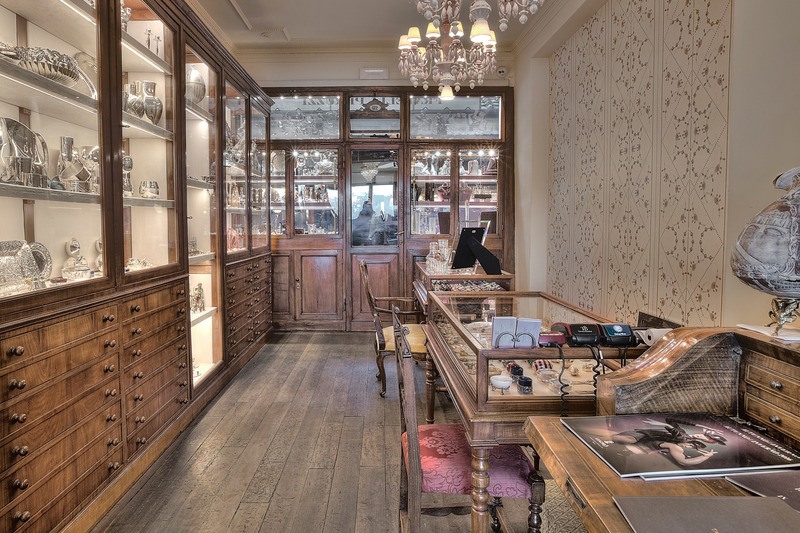 Luigi Ricci, a goldsmith whose workshop is located today at nr.16/red, permitted his shop to serve as an experiment, but the results were not satisfactory: instead of bringing order and symmetry, the perspectives were even more and confusing. On November 3rd, 1844 a huge sudden flood covered the streets, squares and houses of most of the city. In 1901 the only just created Goldsmiths’ Association asked the Town Council to put a fountain with a busto of Benvenuto Cellini, the goldsmith of goldsmiths, to celebrate his fourth centenary. They also asked to put on the railing a sign by Isidoro Del Lungo to consecrate “the glorious traditions of Florentine genius and peaceful labour”. It is said that when Hitler visited Italy and Florence, Mussolini had part of the original Vasarian Corridor pulled down, so that the Führer could better enjoy the landscape. In summer 1944, when the Germans decided to blow up all the city bridges to stop the enemy advance, the only one that was saved was the Old Bridge, due to its antiquity and to the intervention of Gerhard Wolf (see the 2007 sign in the little square under the loggia). It was nevertheless impossible to cross the bridge because all the surrounding buildings had been blasted. In 1955, after the end of World War II, a consolidation campaign was started, which aimed at chaining up the pillars, filling up the pit with gravel and cement where it had been eroded, and protecting the pit itself with a diaphragm to be set up downstream. Notwithstanding the need for restoration, everything suddenly stopped. In 1958 the bridge was closed to vehicles and a more detailed program was set up in order to better study the subsurface’s stratigraphy, the pit’s consistence, and the conditions of the pillars and abutments’ foundations. In 1959 the Monuments and Fine Arts Office first checked on the static conditions of the Vasarian Corridor: they pointed out at once critical static conditions, and walls jutting out and ready to make the entire bridge collapse. The bridge underwent an immediate restoration but, as already in the past, Nature made fun of all this and plagued Florence with the well-known flood of November 4th, 1966. 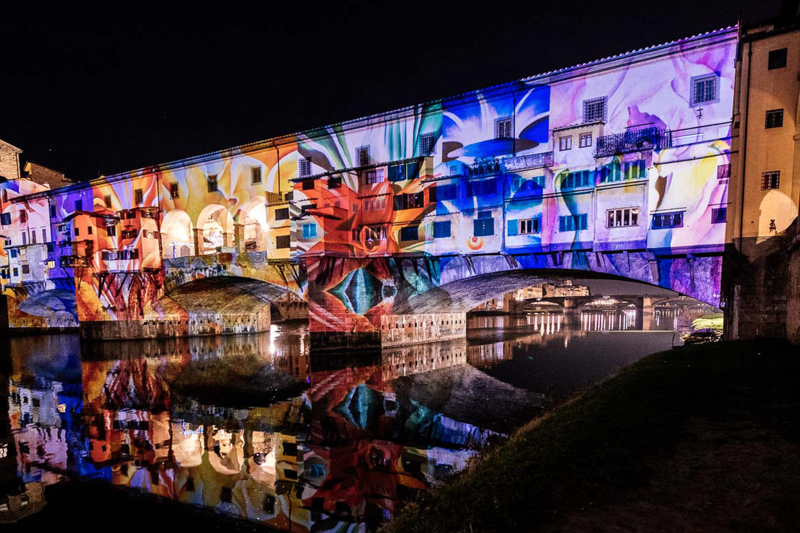 During that night only a few Florentines realized and could try to save their goods by crossing the river: the Ponte Vecchio Bridge had stood the impact and generously helped its fellow-citizens. The Florentine artistic heritage was severely hit. Just after the flood, the bridge was restored and consolidated again, and between June 1977 and November 1980 the pit’s plane was lowered by one meter, giving the bridge a new life. 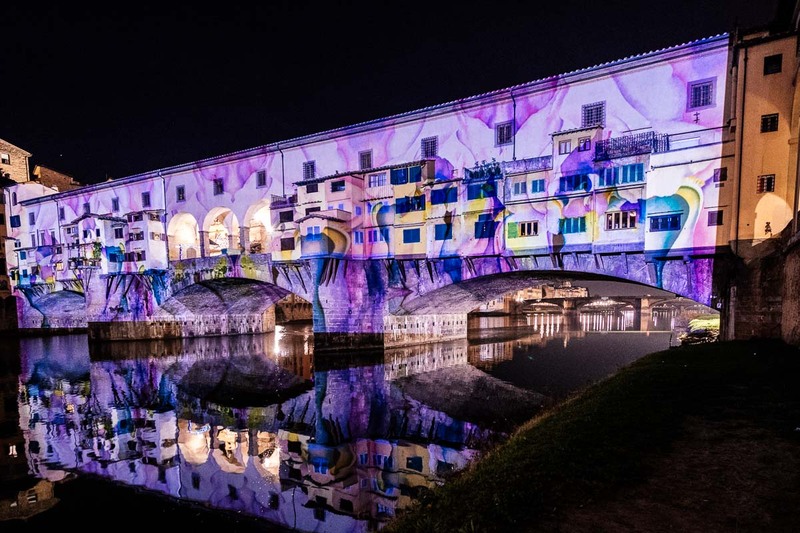 Thus today, after fires, floods, wars and the effects of human folly and carelessness of the past seven centuries, the Ponte Vecchio is still standing, immortal and glorious, strong in its grand victory against time. Its picturesque image still attracts people and tourists from everywhere in the world: visitors of all kinds are mesmerized by the magnificence of noble metals like gold and silver, by precious stones and by the unique window displays.